1. Students interested in Hawthorne's relationship to Quakers might consider his representation of them in "The Gentle Boy," "Main Street," and The Scarlet Letter and then use the passages from Claudia Durst Johnson and Margaret Moore to better understand how Quaker beliefs differed from Puritan beliefs. A consideration of the following questions might prove productive. Why would Hawthorne have admired the Quakers? Why would Hawthorne have been critical of the Quakers? To what extent does his family history shape his response to them? It may be worth visiting the Faith and Religion portion of this website to gain further general insight into these questions. 2. It is interesting to note that "The Gentle Boy" is the only Hawthorne tale that Sophia illustrated and the only one that Hawthorne dedicated it to her. Read "The Gentle Boy" carefully paying particular attention to the similarities and differences between Dorothy and Catherine, Ibrahim's two mothers. When you are finished, read the introductory page to the Hawthorne and Women portion of this website as well as the account of Hawthorne's wife, Sophia Peabody . Is there anything in Sophia's character or in Hawthorne's attitude toward women or toward Quakers that would induce him to connect this particular story so intimately with his wife? It may be helpful to consider some of Hawthorne's other women characters such as Hester Prynne of The Scarlet Letter or Zenobia Pierce of The Blithedale Romance before you reach your conclusions. 3. 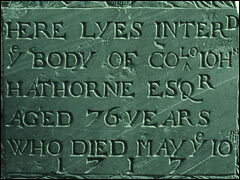 Hawthorne often admires the Quakers in his stories, representing them as "wanderers" who, as he writes in "Main Street,"
have received from Heaven a gift that, in all epochs of the world, has brought with it the penalties of mortal suffering and persecution, scorn, enmity, and death itself;--a gift that, thus terrible to its possessors, has ever been most hateful to all other men, since its very existence seems to threaten the overthrow of whatever else the toilsome ages have built up;--the gift of a new idea. And then the thought stole into his mind, that this young girl possessed the gift to comprehend him, better than all the world beside. And what a help and strength would it be to him, in his lonely toil, if he could gain the sympathy of the only being whom he loved! To persons whose pursuits are insulated from the common business of life--who are either in advance of mankind, or apart from it--there often comes a sensation of moral cold, that makes the spirit shiver, as if it had reached the frozen solitudes around the pole. What the prophet, the poet, the reformer, the criminal, or any other man, with human yearnings, but separated from the multitude by a peculiar lot, might feel, poor Owen Warland felt. What are the implications the similarities between these descriptions? Are Quakers and artists somehow alike? If so, how? If not, how are the likenesses in the descriptions misleading? Is Hawthorne's ambivalence toward both Quakers, indeed all religious advocates, similar to his ambivalence toward artists? Is the alienation Quakers experience identical to the alienation experienced by artists? What else can you see?